Write to: Walter Merricks C.B.E. - Thanks Gordon Brown, Prime Minister. In 2003, over 200 people invested in a company investment scheme promising the Earth. Now, some years later, those perpetrating the fraud, which this company appears to have been set up directly to achieve are sunning themselves in far flung corners of the globe, have made off with millions of our money. Through the intricate workings of a Legal system which has all the honor and goodness of a hungry viper, through a high-street bank who are paying millions to more lawyers to keep them out of jail which in itself is like a modern day highway robbery. And through a Court system and Law Industry with a bite as nasty as a gummy old-lady sucking the chocolate from a Brazil nut and, let us not forget, a financial industry which seems totally bent on covering the tracks and throwing accusations around without any thought for the pain and suffering over 200 people have suffered as a result. Adding insult to injury, the DTI have made the biggest of pigs ears of the case against these fraudsters clearly demonstrating that the DTI's plans to stamp out fraud and the causes of fraud is nothing but general lip service - thanks must surely go to the Rt Hon Alan Johnson MP and the Rt Hon Gerry Sutcliffe MP for their Department's parts in letting the crooks off the hook. Please feel free to drop them an email to thank them (simply click on their names)! 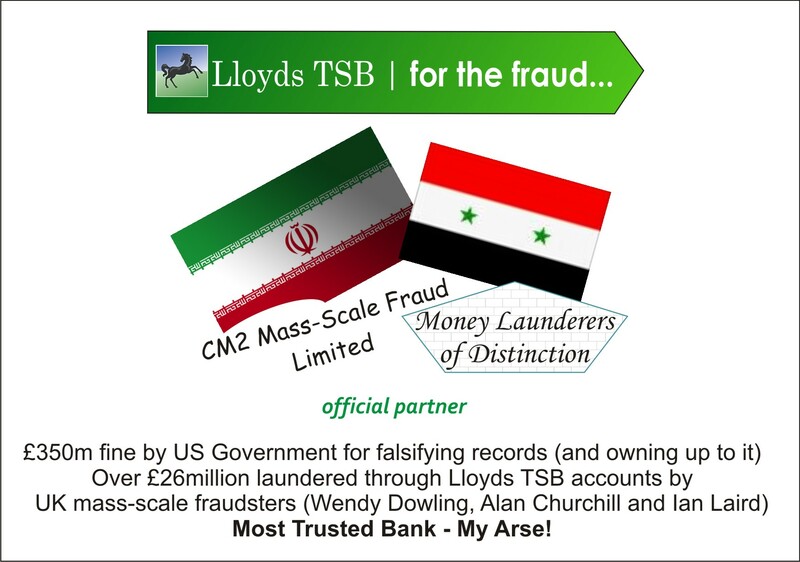 As of today, you can see the ever increasing number of government departments, quangos and regulatory bodies put in place to protect this sort of mass-scale fraud implicitly assisted by the the country's most trusted banks - trusted by whom, one asks! Check out the original fanfare from the DTI here, and a subsequent fanfare here too! The Times had this to say! This site, it is hoped will act a repository of all things relating to this fraud, hopefully ensuring that those involved with the crime are clearly aware of the hurt and suffering and inhumanity that they have offered.